Many veterans live with the lingering effect of post-traumatic stress disorder, often compounded by a lack of family and social support networks. They can experience difficulties adjusting to post-military life; military occupations are not always transferable to civilian jobs, placing some veterans at a disadvantage when competing for employment. Pine Street’s Veterans’ Services connect homeless veterans with housing opportunities, employment and community services that are specifically available to men and women who have served in any branch of the U.S. armed forces. 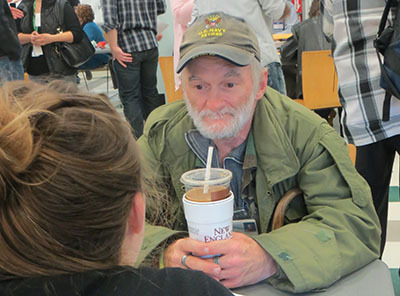 Veterans’ Services case managers also perform regular outreach to area shelters (including Pine Street’s), community centers, hospitals and congregations. Often, veterans lack copies of the military records required to receive veterans’ benefits; others need assistance in documenting a disability or upgrading their discharge status before they can receive federal benefits. Others simply have not been informed about the programs already available to them. Pine Street manages two dedicated houses for veterans. Learn more about Hartford Street House and North Bellingham Veterans Home. "I never thought, ‘I want to be homeless,’” DJ said. “I didn’t want to be in this situation. Luckily this program was here for me when I needed it. They’re helping me get my thoughts in order. I’m taking a better look at myself, and it’s really motivated me to help someone else and pay it forward. My ambition is back." Are you a homeless veteran who needs assistance or shelter?